Excursión de 5,5 horas de la fauna, flora y cascadas de Jasper, con crucero por el lago Maligne de Jasper. El Valle Maligne se encuentra dentro del amplio Parque Nacional de Jasper en Alberta, Canadá. Con esta excursión, viaje por el escarpado paisaje con facilidad y llegue a algunos de los paisajes más espectaculares de la región con toda comodidad. 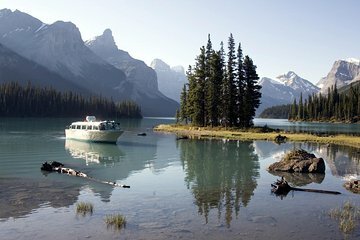 Descubra las principales atracciones naturales como el Cañón Maligne y el lago Medicine a pie, y disfrute de un crucero panorámico de 90 minutos por el lago Maligne. A lo largo del camino, esté atento para avistar animales locales como osos, águilas, ciervos y alces en su hábitat natural. The tour guide, Ross, was very knowledgeable and entertaining. He pointed out some interesting features of the waterfall that we would have missed if we had gone there on our own. He went out of his way to make the trip special, for example, showing us Lake Maxwell when it was absolutely calm and we could take a photo of the mountains mirrored in its water. Such calmness was unusual for the time of day we were there. We even saw some elk. We were picked up at our hotel. The bus was very nice and air conditioned since the temperatures were reaching 80 for the day. Was nice my husband could enjoy scenery instead of watching traffic. Guide was very informative and we stopped at many interesting sites along the way to and from the lake. Did not see any wildlife though as I guess it was too warm. Did see an eagles nest and eagle In a Tree from a distance. There was an opportunity for lunch at the lake. As busy as the parks are it was wonderful doing the tour as we were able to get right to our stops and park with no problems. Glad we did tour. Our tour of Maligne Canyon and Maligne Lake with the boat cruise to Spirit Island was excellent. The weather cooperated and we had a beautiful warm fall day. Our tour guide, Marie did an outstanding informing us of the history of the area as well as the wildlife that we might see, the plants and the spectacular views where she stopped for us to take photos. I highly recommend this tour. Our guide Ross was very knowledgeable and the boat trip out to Spirit Island was breathtaking! Saw one bear, but otherwise not much of a wild life tour. Waterfalls tour was very short. The Maligne lake was awesome!